Agave sweetened, no bake, chocolate coated, snack bar that tastes just like a candy bar with a little less guilt. So what exactly is a “Heck Ya Bar“? Well, it’s named after what came out of my mouth after I took a bite! I could have called it a granola bar, but it’s not because it contains no granola. I could call it a protein bar, but I didn’t add any extra protein so I didn’t want to be misleading. 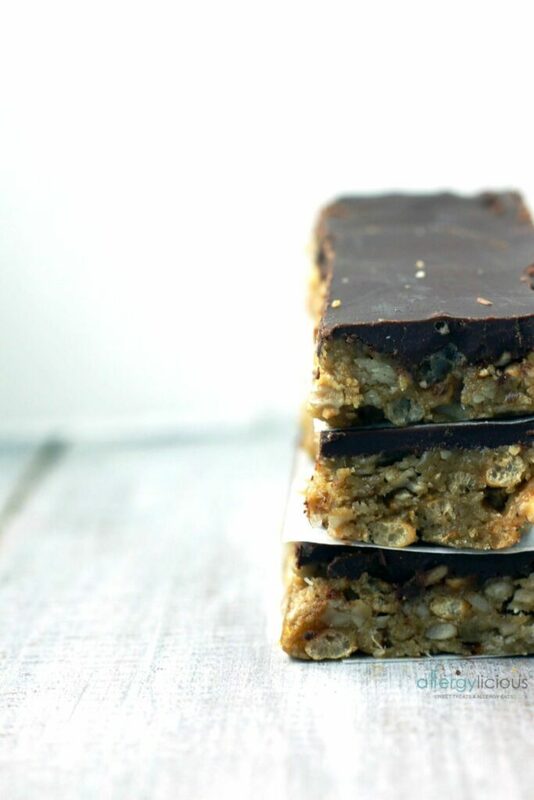 It’s more of a crunchy, sweet, sunflower seed packed, no-bake, allergy-friendly, vegan, gluten-free bar. Obviously you see why I opted to call these delicious treats, Heck Ya Bars instead of any other name. Heck Ya I want another one! I’m pretty sure my kiddos feel the same way. They ate the entire first batch before that could even get any photos for the blog so I obviously had to make a second batch of my Heck Ya Bars. It was a sacrifice to do so, but I did it for you (and maybe because I wanted to eat some too). 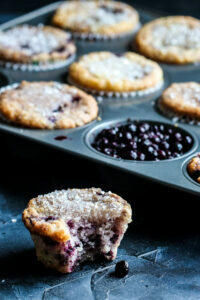 For my second batch, I added in some crispy rice cereal which is included in the recipe below. The Heck Ya Bars were enjoyable before, however, the light and airy crispness of the puffed rice just added an extra dimension of texture to these bars that you’ll want to include. 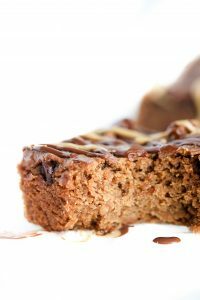 Feel free to make whatever changes are needed to fit your families allergy needs, but if you follow the recipe exactly, these bars are vegan, gluten-free and top 8 free. 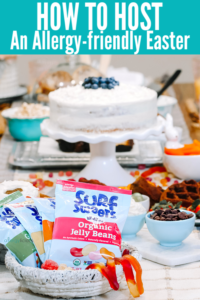 You can always change out the type of flour you use (almond, oat, coconut), mix up the sweetener (brown rice syrup, maple syrup, honey) or even substitute granola in place of the crisp cereal. There are a lot of options, so make it your own. Pulse 1/2 of the sunflower seeds into a fine meal in a food processor. Add dates, SunButter, agave, gluten free flour, shredded coconut and vanilla extract. Pulse until a sticky ball is forms, scraping down sides as needed. Fold in remaining sunflower seeds and rice cereal. Line a 9×9 dish with parchment, leaving a little extra of parchment revealed to use as a handle later. Add mixture to dish and press evenly, making sure to fill corners. Dough is sticky, so I like to dampen my hands before I press OR lightly spray with non-stick oil. *Refrigerate 6 hours or overnight. Combine chocolate chips and coconut oil in a glass bowl over a pot with simmering water (or use a double boiler). Stir until chocolate has melted. Remove from heat and pour chocolate on top of refrigerated dough. Spread evenly then return to fridge for at least 1 hour for chocolate to harden. Use parchment to lift bars out of dish. Cut into rectangles or squares, depending on size you prefer. Refrigerate until ready to eat or serve immediately. I have also found success letting the dough harden 1 hour then adding the melted chocolate . You then can refrigerate overnight. 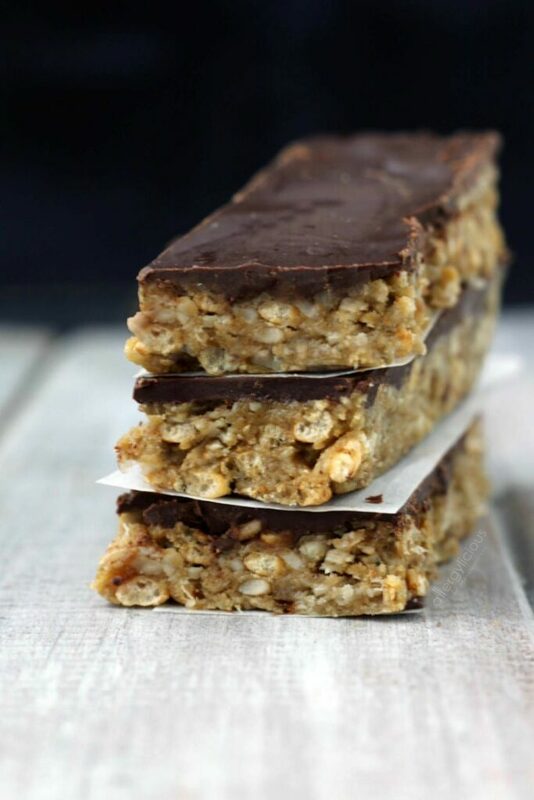 Have you ever made your own No-Bake snack bars? If so, what are your most loved add-in’s? Dried fruit, cereal, seeds, coconut? Be sure to comment below. And if you’re still craving for more easy-to-make snacks, we have more for you. Be sure to check out the No Bake Bites, Chocolate Chip Cookie Dough Balls, Vegan Chocolate Protein Bites, or Protein Candy Bar ! I bet the kids enjoy those bars. This time I bought sun butter, that is so good. I am eating it just plain. So I can imagine this will be very delicious bars. These look so good! I could go for one right now! I love the name of these bars AND the ingredients. I think I have everything on hand, so these need to happen this week. That’s what my kids say every time I make them! I win “Best Mom” award on those days.